Our You Are More Than campaign is back ! We have lots of activities planned, including free exercise sessions, and the best news of all… the Hearing Dogs are back! You can also grab some free soup and take advantage of our study and chill out spaces. As part of our Your Are More Than Your Dissertation events we’re heading out to as many of our campuses as possible, handing out smoothies to encourage you to take a short break from work. We’ll be outside Harley Library on Thursday 25 April 2019 near the front desk from 11:00 onwards. Get there quickly because once they’re gone, they’re gone! Photography and videography may be taking place, please speak to a member of SUSU staff if you do not wish to be featured. As part of our Your Are More Than Your Dissertation events we’re heading out to as many of our campuses as possible, handing out smoothies to encourage you to take a short break from work. We’ll be in the NOCS Exhibition Space on Tuesday 30 April 2019 from 11:00 onwards. Get there quickly because once they’re gone, they’re gone! Photography and videography may be taking place, please speak to a member of SUSU staff if you do not wish to be featured. Join us across at Archers Road Halls for some FREE FOOD. A range of food options will be available. Join us across at City Gateway Halls for some FREE FOOD. A range of food options will be available. As part of our Your Are More Than Your Dissertation events we’re heading out to as many of our campuses as possible, handing out smoothies to encourage you to take a short break from work. We’ll be on Avenue campus on Tuesday 07 May 2019 near the front desk from 11:00 onwards. Get there quickly because once they’re gone, they’re gone! Join us across at Erasmus Park Halls for some FREE FOOD. A range of food options will be available. Following its massive success in 2018 we’re partnering with Altitude Events to bring Mini Golf back to SUSU for another year. This 9-hole course comes complete with tunnels, loops, themed holes and even a windmill. You DO NOT want to miss this! This event will be taking place on the grass outside of Building 40, and as such may be cancelled at short notice in the case of poor weather. Photography and videography may be taking place, please speak to a member of SUSU staff if you do not wish to be featured. As part of You Are More Than this winter we are booking out lots of Union spaces for study and chill-out spaces! Studying is important but we would like to encourage taking lots of breaks, self-care and healthy study habits. Meeting Rooms 1 & 5 (Building 42) and Meeting Rooms 6 & 7 (Building 40) will be available every day from Monday 13 May to Friday 07 June during normal Union opening hours for studying. Revision tools, tips and snacks provided! Bar 2 (Building 42) is becoming our very own chill-out space from Monday 13 May. Featuring bean bags, comfy blow-up chairs, fidget games, oil bubble lamps, free fruit, cute plants and fairy lights. Come and use the space to chill with friends, play some card games or have a well-deserved nap to the sounds of relaxing music. Join us across at Glen Eyre Halls for some FREE FOOD. A range of food options will be available. Our ever-popular petting zoo is back for another year - chill out with our furry and feathered friends! This event will be taking place on the grass outside of Building 40, and as such may be cancelled at short notice in the case of poor weather. Photography and videography may be taking place, please speak to a member of SUSU staff if you do not wish to be featured. Join us across at Highfield Halls for some FREE FOOD. A range of food options will be available. Join us across at Mayflower Halls for some FREE FOOD. A range of food options will be available. Meet the adorable hearing dogs and chill out in their company! 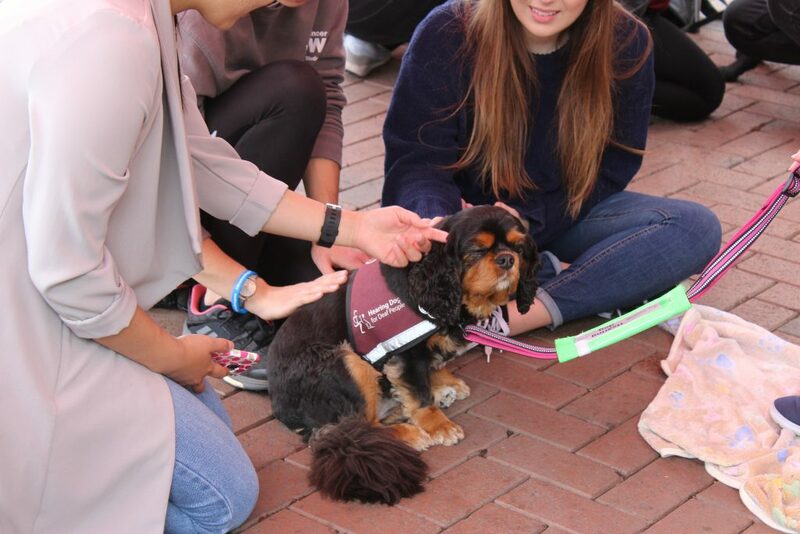 We've partnered with Hearing Dogs for Deaf People for a number of years to run this fantastic event, and we're pleased to confirm that it is coming back to Highfield Campus as part of You Are More Than 2019. This event will be taking place on the Redbrick (in the case of good weather) or on the Concourse of the Students' Union (Building 42) (in the case of poor weather). Photography and videography may be taking place, please speak to a member of SUSU staff if you do not wish to be featured. Please note that the availability of the dogs can change at the last minute, and as such any timings are subject to revision. As part of our Your Are More Than Your Dissertation events we’re heading out to as many of our campuses as possible, handing out smoothies to encourage you to take a short break from work. We’ll be outside the Lecture Theatres in the South Academic Block on Friday 24 May 2019 from 11:00 onwards. Get there quickly because once they’re gone, they’re gone! Join us across at Connaught Halls for some FREE FOOD. A range of food options will be available. Join us across at Montefiore Halls for some FREE FOOD. A range of food options will be available. Join us across at Chamberlain Halls for some FREE FOOD. A range of food options will be available.